Mast cell tumors are one of the most common cancers in dogs. They develop from particular cells of the immune system called mast cells, which normally treat inflammation and allergic reactions in a pet’s body. There is not one single cause of mast cell tumors. Fortunately, the majority of mast cell tumors are localized to one spot. However, rarely they will spread to lymph nodes, the blood, the spleen, the liver, the lungs, the bone marrow, or other skin locations. If the tumor spreads, or metastasizes, to other areas of the body, multi-modality therapy will be required. Symptoms vary depending on what organ is affected. For most dogs, mast cell tumors are not a painful cancer. In fact, many dogs with mast cell tumors are taken to their veterinarian because the owner feels a lump in or under the skin. Some dogs will have other non-specific signs such as decreased appetite, increased respiratory rate, vomiting, diarrhea or a sluggish activity level if other organs are affected. Mast cells have inflammatory mediators in them that can cause shock-like signs (severe acute lethargy, collapse, decreased appetite, pale gums and vomiting) or stomach ulcers (decreased appetite, vomiting “coffee ground” particles and dark, tarry, stool) if the cells are disturbed and the mediators leak out. In most pets a diagnosis can be made with a needle aspiration of the tumor (a procedure performed with the patient awake using the same size of needle used to give a typical vaccine). Normally, the sample can be evaluated and a diagnosis made at the initial appointment; however, the sample will also be sent to a lab for confirmation. After the tumor is removed, a biopsy is performed on the tumor. This will provide the oncologist more information about your pet’s mast cell tumor, such as grade (1, 2 or 3), which sometimes affects prognosis. Additionally, the pathologist will determine the margin of normal cells around the tumor to assess whether surgical removal was complete or incomplete. 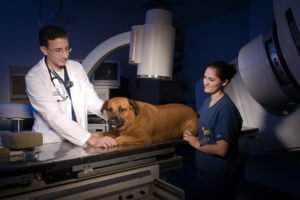 This information is essential to help a veterinary oncologist determine optimal additional treatment options. Clinical staging involves completing a set of diagnostic tests to determine if the mast cell tumor has spread to other parts of the body. These tests can include any of the following: routine blood work, chest radiographs (X-rays), abdominal ultrasound, fine needle aspiration or biopsy of any enlarged local lymph nodes, and bone marrow aspiration. 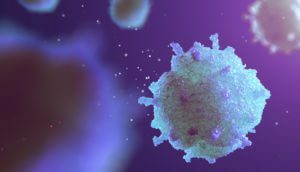 Treatment recommendations and prognosis of mast cell tumors depend on a few important factors, such as tumor grade, tumor location, complete or incomplete surgical margins, and whether other organs are affected. Your oncologist will evaluate all these factors and inform you of the overall prognosis and best treatment options. Treatment almost always includes surgical removal of the primary tumor when possible. Radiation therapy is recommended for tumors that have not been completely removed or that cannot be removed based on size or location. Chemotherapy is recommended for grade 3 tumors, if there is evidence of spread, or if the tumor cannot be removed. Radiation therapy is given as a small dose of powerful X-rays for multiple treatments over approximately four weeks. Potential side effects can include hair-loss or redness and ulceration at the treatment site. Dogs do not get systemically ill with localized radiation therapy to the skin. If a tumor in the mouth is being treated, hyper-salivation and inflammation of the gums may develop that can affect appetite and energy. These localized side effects typically begin during the final week of treatment or the week following treatment and take about two weeks to completely resolve. Combination chemotherapy protocols that utilize multiple drugs at a time may be recommended. 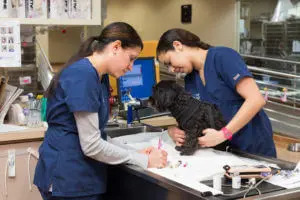 The chemotherapeutic drug toceranib (Palladia™) is a FDA-approved drug for canine mast cell tumor that is showing great promise in treatment of this cancer. The protocol chosen by the oncologist depends on a number of factors. Potential side effects include mild and self-limiting stomach upset (vomiting and diarrhea) and bone marrow suppression (a drop in the white blood cell level) making your pet susceptible to an infection. Most pets feel normal even if they have a low white blood cell level. Occasionally, antibiotics are prescribed if fever associated with a low white blood cell count is present, as an infection is possible. Dogs typically tolerate both radiation therapy and chemotherapy remarkably well.